For the most part I try to bring my lunch from home, but on Friday’s I like to go out and leave the office far far behind. After all, a girl can only handle so many Amy’s Frozen Dinners and Lean Cuisines in a week. I tend to take the T to The Pru and meet CK on these days. Lately we’ve been having a lot of lunch dates at PF Changs. I’d describe PF Changs as the asian Olive Garden. It tastes good, the portions are large, and the wait staff tempts you mercilessly with sinful deserts. Just wait until they wave the Great Wall of Chocolate cake in front of your eyes (all 2200 calories of it). It’s painful to decline, but a necessity since the lunch portion of basic Beef and Broccoli packs a whopping 900 calories (without the rice). I don’t know about you, but if I’m going to consume that many empty calories they better be wine or cheesecake based. 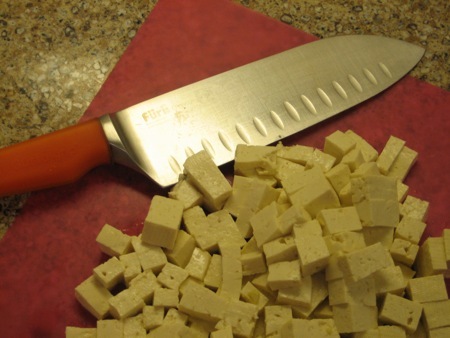 Never cooked with, bought, or looked at Tofu before? Well neither had I! Yes, this was my first foray into cooking with Tofu. It honestly couldn’t have been easier, just drain it and slice. I actually used the whole 14 ounce block of Tofu in this recipe (as opposed to the 6 ounces called for). 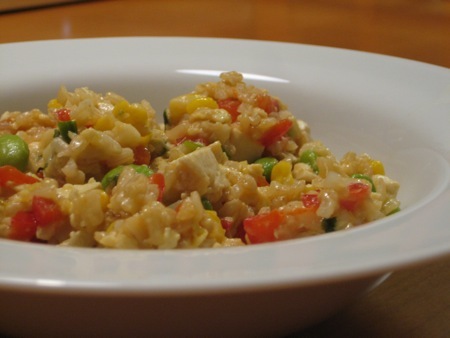 Mostly because I had no idea what I was going to do with half a block of leftover tofu and I hated the thought of it just going to waste; so into the rice it went. And for once I’m looking forward to a non-Friday lunch! 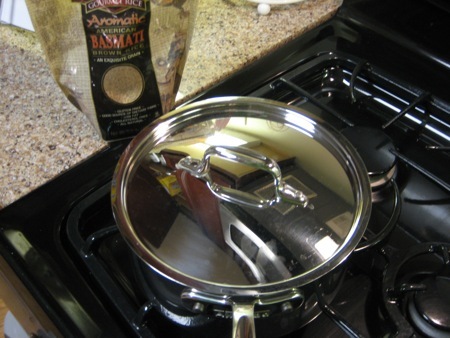 Heat 1 tablespoon of oil in a wok or large skillet until very hot. 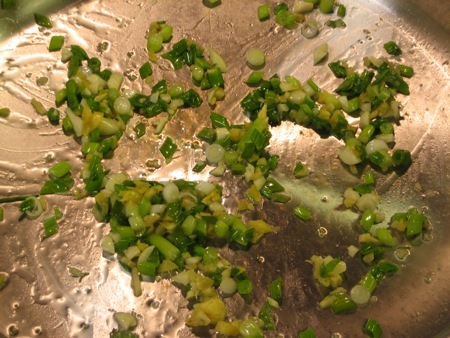 Add the garlic, scallions and ginger and cook, stirring, until softened and aromatic, about 2 to 3 minutes. 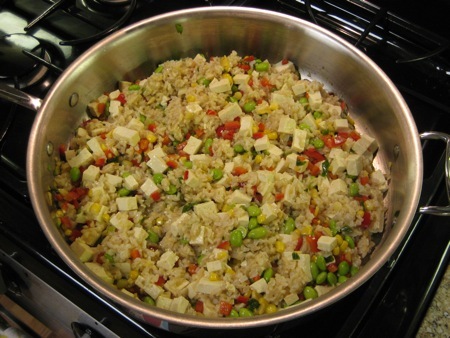 Add the rice, red pepper, edamame, corn and tofu and cook, stirring, until heated through, about 5 minutes. 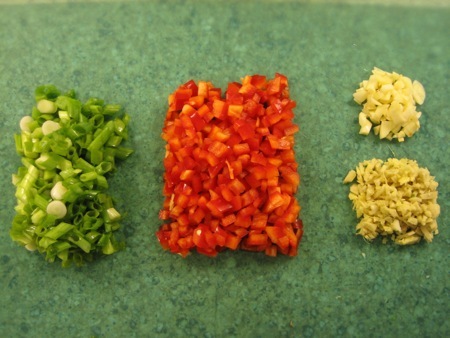 Make a 3-inch well in the center of the rice mixture. Add 1 teaspoon of canola oil, then add the eggs and cook until nearly fully scrambled. 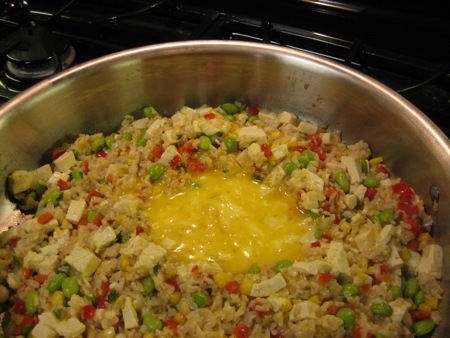 Stir the eggs into the rice mixture, then add soy sauce and incorporate thoroughly. Serve hot. ok i thought this was a vegan dish when i saw the edamame and tofu for protein. BUT THEN we got to eggs. WTF Ellie Krieger?! Good thing I’m not vegan! 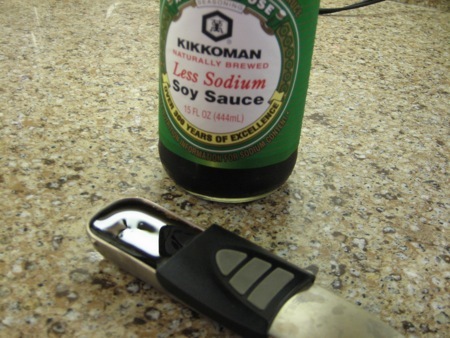 Will be trying this recipe … but I might double it so as to use the tofu in correct proportions since there’s a ton of protein in here already (with eggs and edamame).